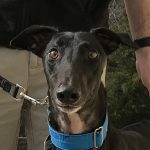 My brother adopted a greyhound years ago from GFNC and I went with him to pick her out. Robin was the most precious greyhound with such a sweet temperment and so polite. He had to put her down today – such a sad time – but we are already planning to go back and find another new baby to love!! Thank you for providing us with such a wonderful addition to our family for 8 years!